Welcome to Fortuna. Explore the frigid landscape of Venus populated with new Corpus threats, subterranean mysteries and an ecosystem on the brink of destruction. FORTUNA: A NEON SLUM BENEATH THE SNOWDown in the underground city of Fortuna, you’ll meet the Solaris: a society of body-augmented individuals who live in debt-internment under Corpus rule. The Solaris live in fear of being “repossessed” — cybernetic limb and organ removal by Nef Anyo’s repo squads. Despite living in terror and debt, the Solaris are a hopeful community who pride themselves in their efforts to terraform Venus. A disbanded resistance front, the Solaris United fought to unshackle the Solaris from the Corpus “Taxmen.” It’s unclear why the movement ended, but rekindling the rebellion in Fortuna is key to a free Solaris society. Made with stolen Corpus technology, turbo-powered K-Drives are ideal for the mountainous Vallis landscape. Find the Ventkids — a local street gang that lives in the ventilation shafts of Fortuna — to create your own personalized K-Drive, then equip K-Drive Mods to increase your max speed, boost speed and more. Design and build weapons of destruction to handle any threat. 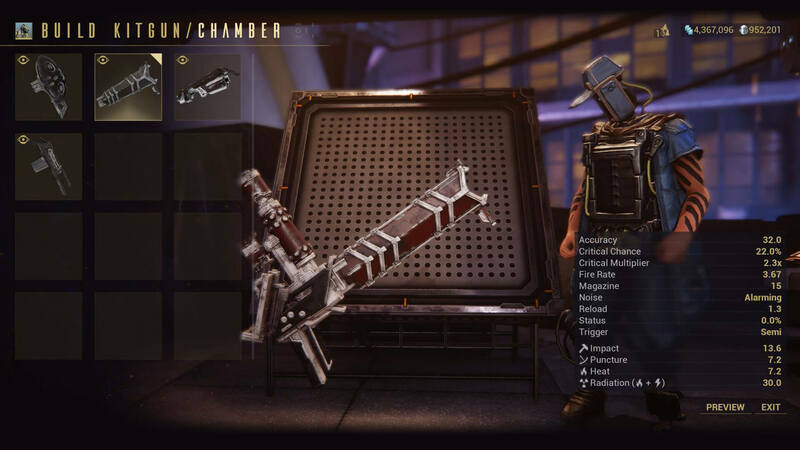 Using a selection of parts available at Rude Zuud’s shop, create a modular Secondary Weapon custom-tailored to suit your playstyle. 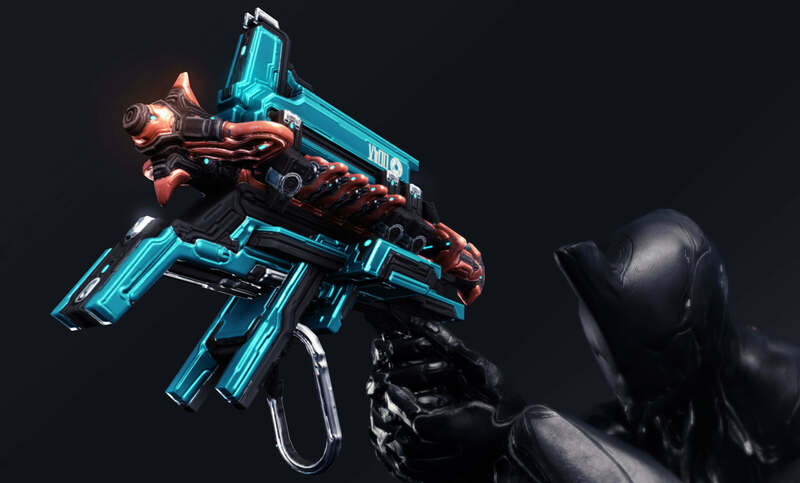 Gild your Kitgun to unlock new cosmetic options. 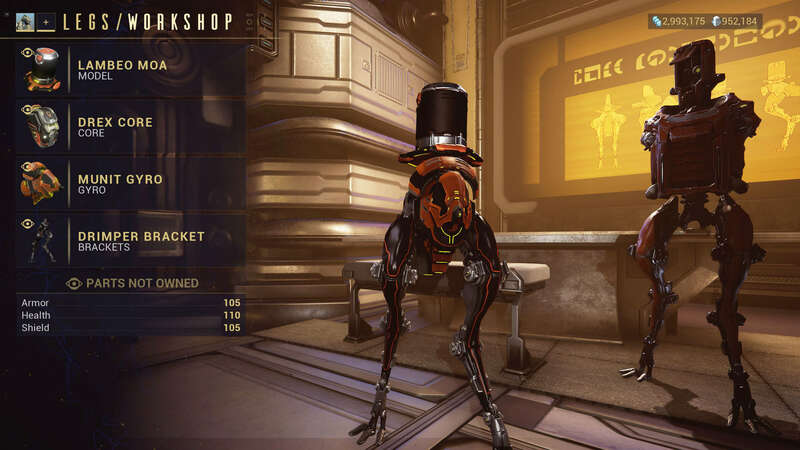 Like most things in Fortuna, the Solaris build their own MOA Companions using stolen Corpus tech. 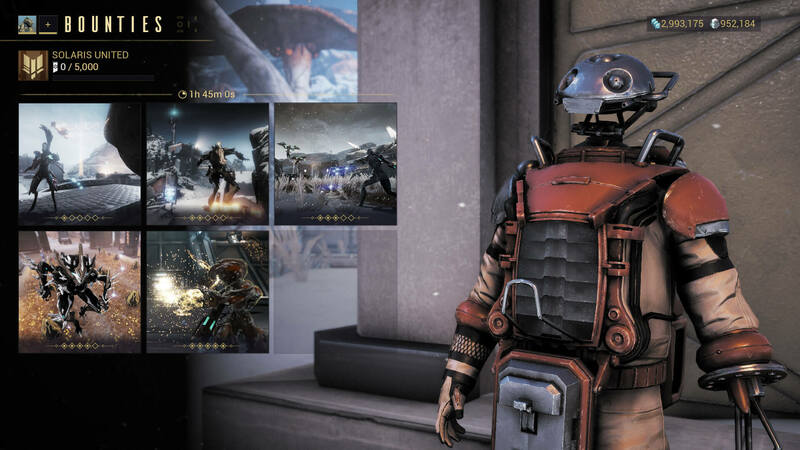 Customize your own MOA to walk beside you, gather loot, use exclusive combat Precepts and more. Wildlife has returned to the Vallis, but the Corpus are destroying these creatures for their Feed and Research Division. Work with The Business to track these endangered species down, tranquilize them and extract them to safety, away from the Taxmen's reach. Fortuna delivers enhanced ways to mine and fish. Visit Smokefinger to purchase the new Sunpoint Plasma Drill, a fast-ignition, high-intensity mining tool that can superheat mineral deposits found around the Vallis. Each mineral has a “sweet spot” to hit for extra rewards. Buy an electrified spear from The Business to catch the robotic Servofish that swim in the coolant lakes and rivers. Dismantle them for scrap parts or trade them in for Standing. 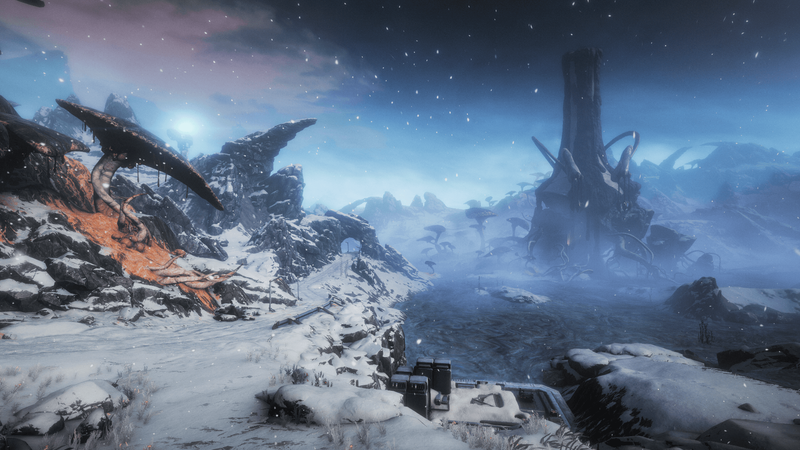 ORB VALLIS, VENUSLocated in the eye of a snowstorm, the Orb Vallis was once a scorching wasteland. When the Solaris reactivated the Orokin coolant towers, life reappeared in the Vallis. Giant looming mushrooms sprung from the snow, and four-legged Virminks appeared in the valleys. 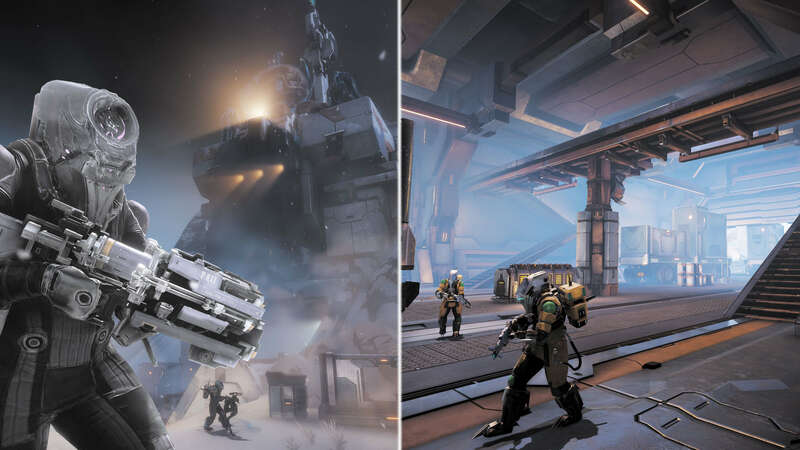 Through their blood, sweat and tears, the Solaris terraformed this barren region into a beautiful, hospitable world — but the Corpus are destroying this delicate balance in their pursuit of profit. The Corpus maintain several facilities around the area, including a bustling spaceport, a secretive research facility and a massive shrine to Nef Anyo. Inside these fully-explorable areas, you’ll find new, specialized Corpus units ready to strike. 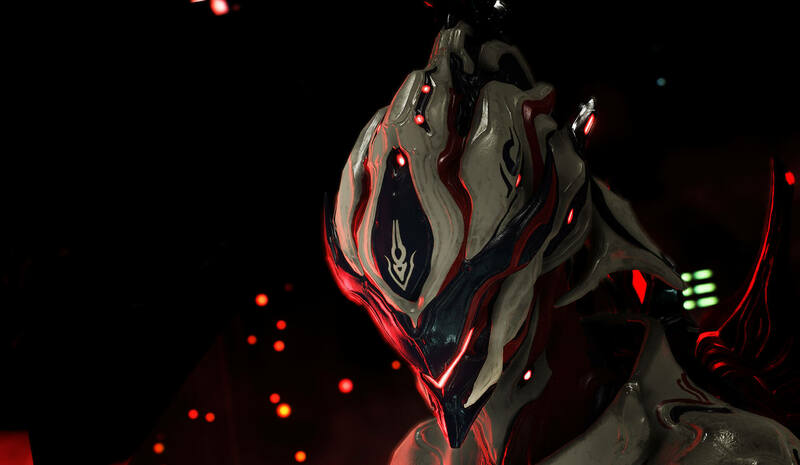 The Vallis was made by the Solaris, but it’s ruled by Nef Anyo and the Taxmen. Step out of line in this Corpus overworld, and reinforcements will arrive to take you out. Capture a Corpus base in the Vallis, and an agent will appear with new Bounties to take on. Complete as many of these Bounties as you want without ever leaving the Vallis. 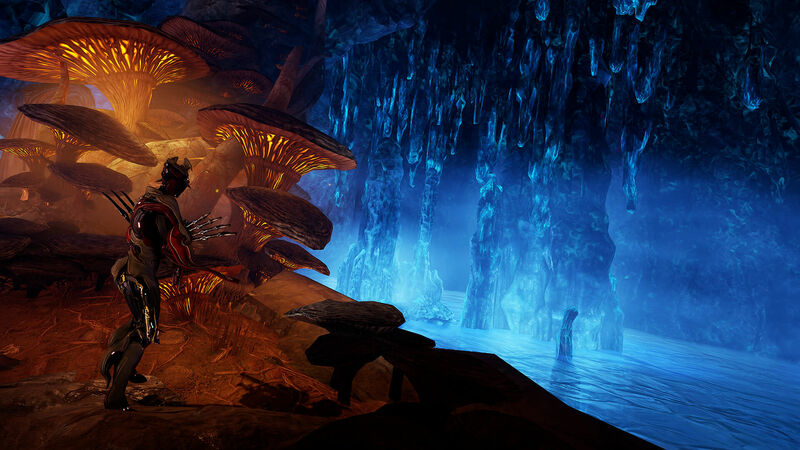 An extensive cave network runs underneath the Orb Vallis. These caves are rich with mining deposits, and the water here is full of unique fish species to catch. The Ventkids have also set up race courses through the tunnels. As you explore the Vallis, beware of mechanical, spider-like machines known as Raknoids. These Corpus-designed creatures range in size and lethality, from tiny Mites to the massive, invulnerable Orbs that loom over the region. Fortuna’s brightest are currently researching how to take down these Orbs. GARUDADeath's crimson maiden, the blood of Garuda's foes imbue her with strength and vitality. Visit Fortuna to earn this vicious new Warframe. 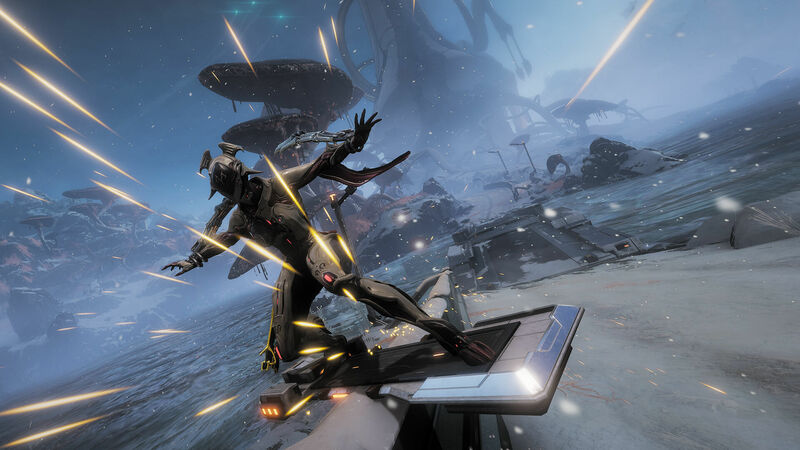 Charge to expand the targeting area, release to send Garuda’s talons careening toward each target in area. Surviving enemies are prone to bleeding. 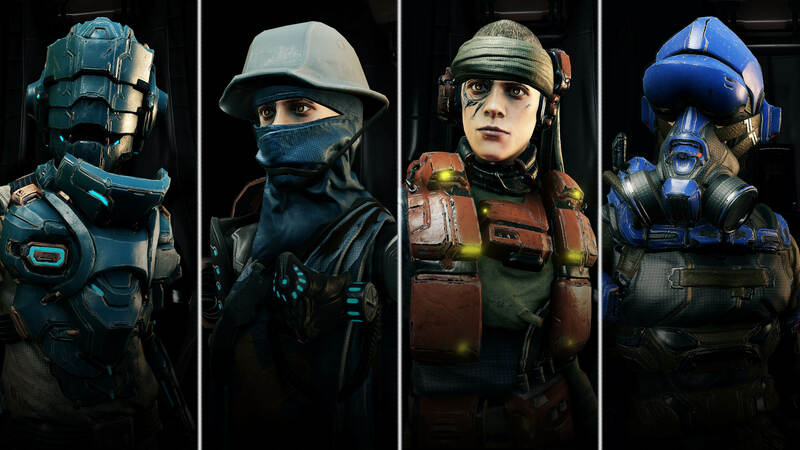 OPERATOR ARMOROutfit your Operator with these Solaris-inspired Customizations. 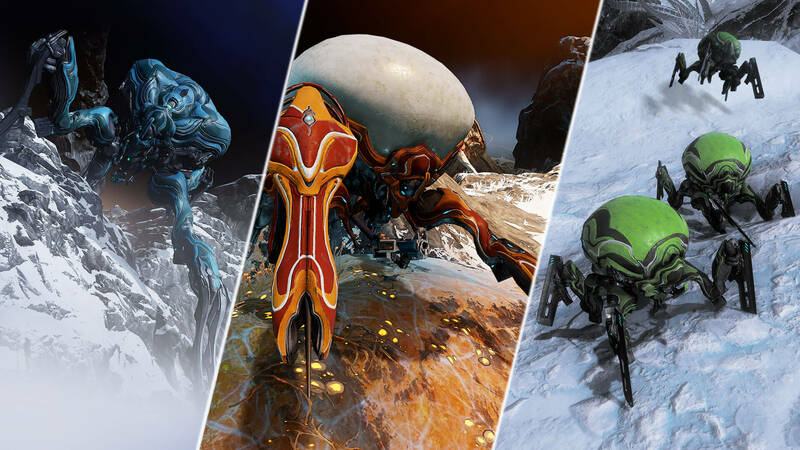 MOD SETSGive your Warframes, Weapons and Companions a boost with new Mod Sets. A Set Bonus is applied when equipping Mods from the same set. 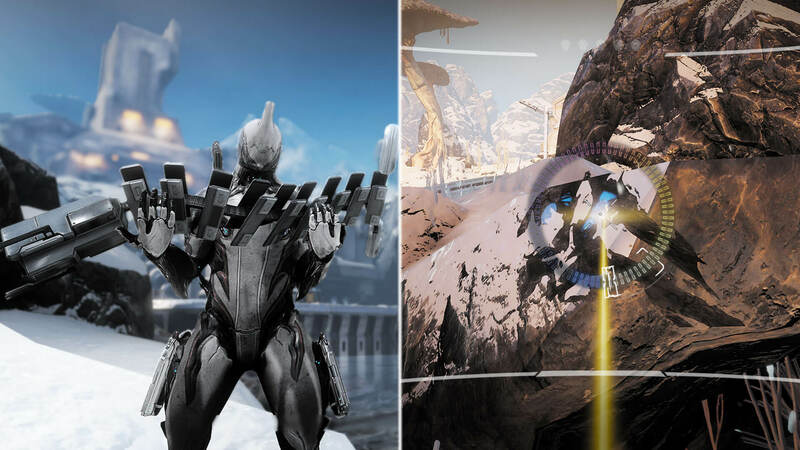 These Mods are available as potential rewards from completing Bounties in the Orb Vallis. 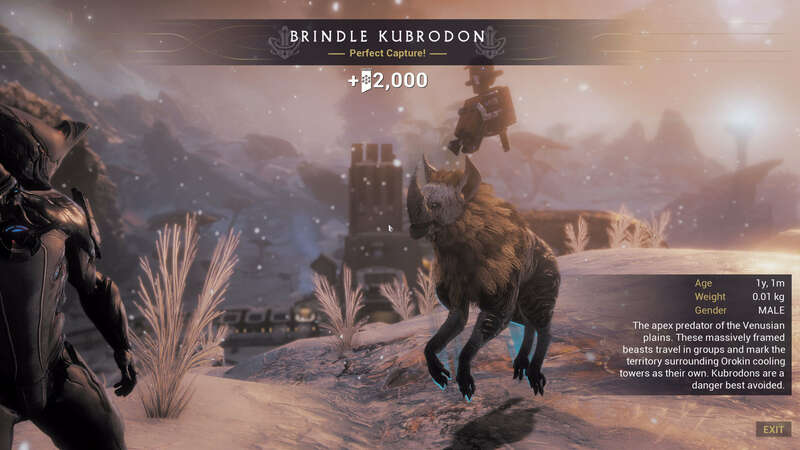 Set Bonus: Kubrow marks an enemy every 15 secs for 12 secs. Killing this enemy applies all status effects on them to other enemies within 30m. Mecha Pulse - Warframe: Killing a Marked Enemy grants +20% armor for 12 secs for each enemy within 30m. Mecha Empower - Aura: +40% Extra Damage vs Marked Enemies. Set Bonus: Kavats create a 10m wide zone every 15 secs, which deals 50 damage/s for 8 secs. 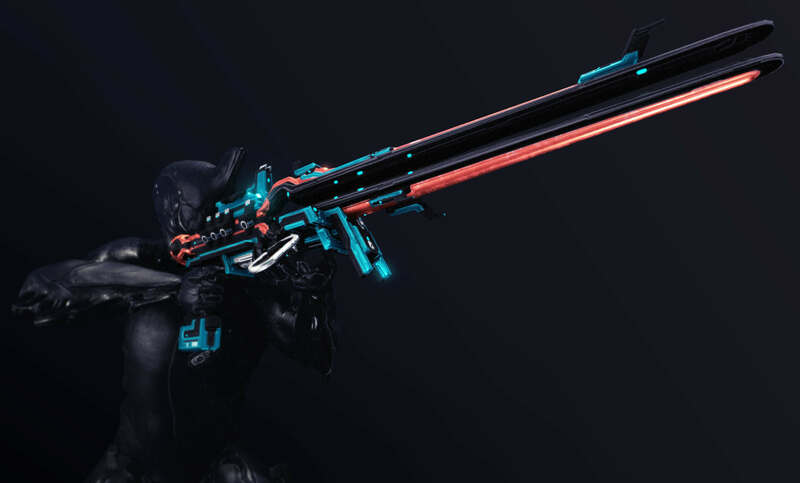 The Business is offering a new Sentinel to aid in your Vallis Conservation efforts. The Oxylus comes with two Precepts for locating Conservation opportunities and resource containers. Also includes a new Sentinel Weapon: the Multron, a burst-fire rifle with armor-piercing rounds. 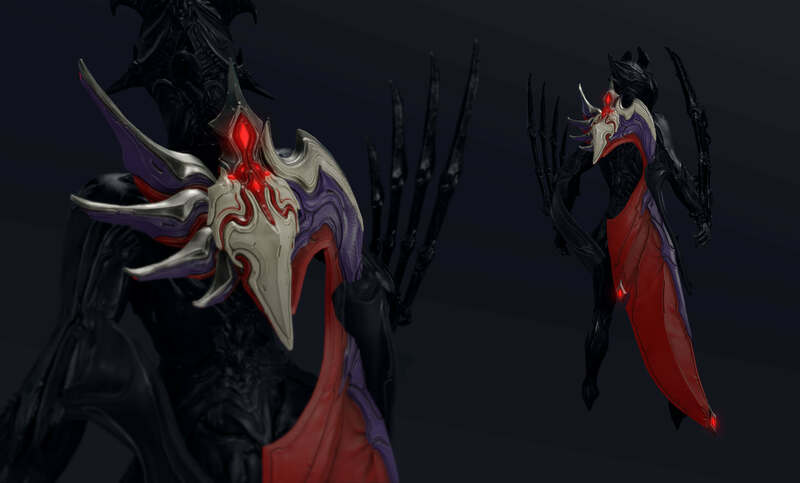 Ayatan Amber Star Blueprint is now available for 10 Vitus Essence from the Arbiters of Hexis. Five new Dojo Pigments are available for research. New Designer Glyphs are here! The Venter Glyphs are illustrated by renowned fantasy artist Pete Venters! 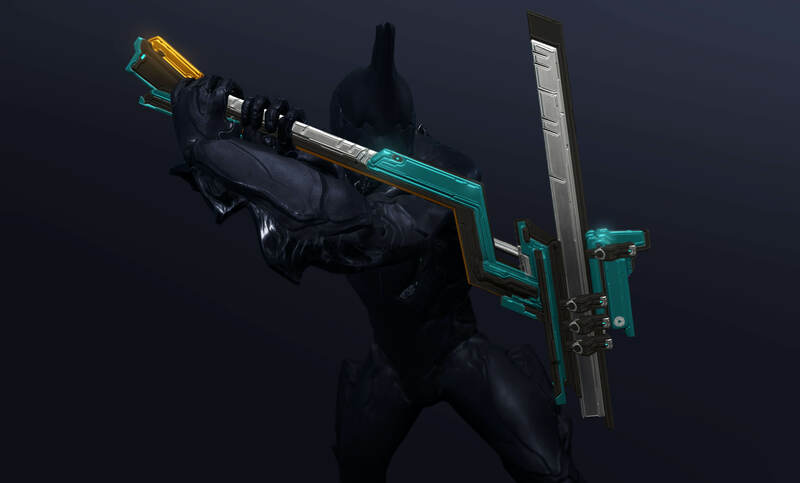 LIMITED-TIME TWITCH DROPSWatch Warframe on Twitch when Fortuna launches to get free in-game items! 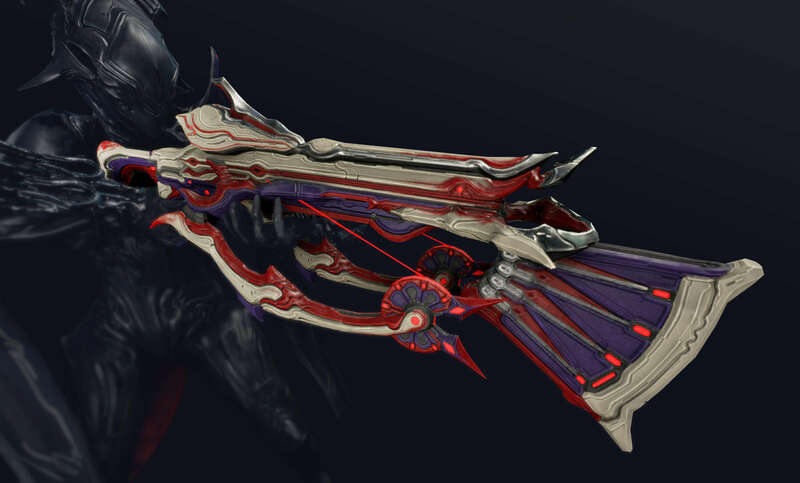 Possible drops include the Nidus and Khora Warframes, a Rifle Riven Mod and more! 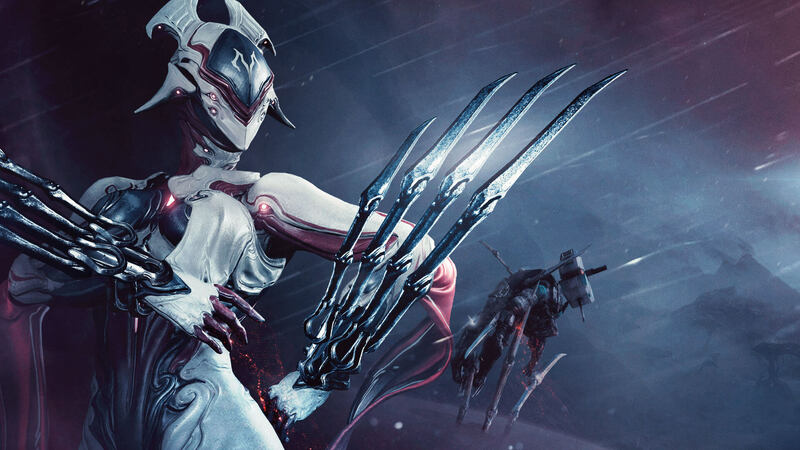 Gear up with limited-edition Warframe merchandise. Get your Fortuna T-shirt and exclusive Poster now, but hurry — these items are only available via pre-order until November 21!